Penobscot County, east-central Maine, U.S. Located in a highland region, the county contains many lakes, rivers, and ponds, foremost among them being the Penobscot River, the longest in the state; nearly all of the river's 350-mile (560-km) course is through the county. Timberland is primarily spruce and fir, with stands of maple, birch, and aspen. Public lands include Scraggly Lake Management Unit and Mattawamkeag Wilderness Park. The county is also the home of the Penobscot Indian Reservation. The county was created in 1816; the name was derived from an Abnaki Indian word meaning "rocky place." Bangor, the county seat, is located on the west bank of the Penobscot River, opposite its sister city, Brewer. Visited by French explorer Samuel de Champlain in 1604 and settled in 1769, Bangor was a boomtown by the mid-19th century as a result of its lumber, milling, and shipbuilding industries. The University of Maine at Orono was founded in 1865. 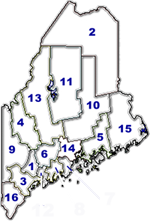 Other communities include Old Town, Millinocket, and Hampden. The main economic activities are the manufacture of paper and footwear, tourism, and agriculture, primarily hay and corn (maize). Area 3,396 square miles (8,796 square km). Pop. (1990) 146,601; (1996 est.) 144,989.